ON0VRT is a repeaterplatform installed at the VRT tower, located in Sint Pieters Leeuw, near Brussels. The platform will house a 6m, 2m, 70cm and a 23cm repeater. 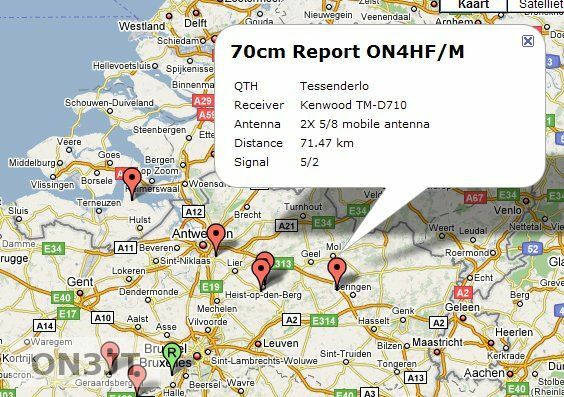 To see the range, I thought that displaying the various reception reports on a map is usefull. So after a couple of days playing with Google Maps and some XML files the current beta site is alive. This entry was posted on Monday, April 7th, 2008 at 20:50 and is filed under Projects. You can follow any responses to this entry through the RSS 2.0 feed. Responses are currently closed, but you can trackback from your own site.